Un-heated, un-filtered honey, with all of the enzymes intact; this honey is a medical marvel as well as a culinary delight. 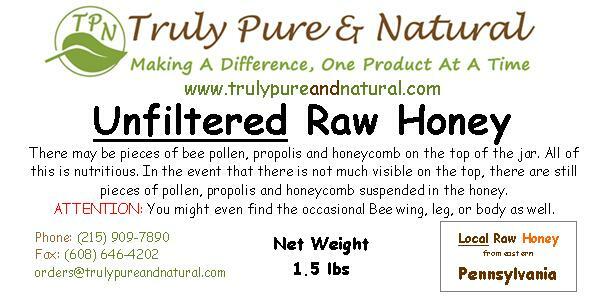 Unfiltered Raw honey is simply spun out of the honeycomb and allowed to crystallize naturally. May be used for all honey needs or as a sugar substitute. 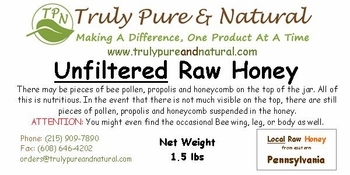 ATTENTION: Contains bee pollen, propolis, beeswax, and possibly bee parts. This honey has all the goodness of the hive! All raw honey will eventually crystalize. Never microwave your honey! To reverse the crystallization process, just set the tightly closed container in tap water (approximately 120 degrees), for 15 to 20 minutes. Refresh with hot water until the crystals are gently melted.